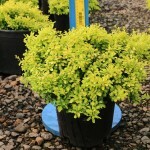 A low growing, dense, compact shrub with bright golden foliage that does not burn in full sun. It produces small, glossy red berries in fall. It develops deep red tints in the fall. It does well in most soils and is drought tolerant once established. It is a great addition to the shrub border, mixed in with perennials, and in containers. PP 17,084.